Guests of Conti Sertoli Salis: Part 3, Wine! When we finished seeing the palazzo, we had a little stroll in the garden, in which an intricate, manicured geometric hedge is winningly juxtaposed with overgrown and out-of-control everything else. 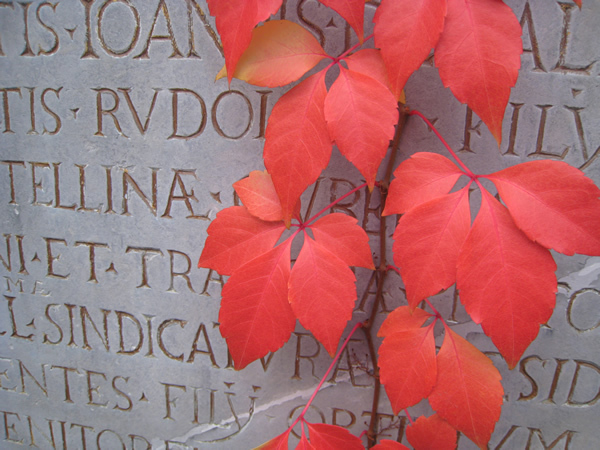 My favorite photo of the day is above – autumn red vines draping down a stone plaque. 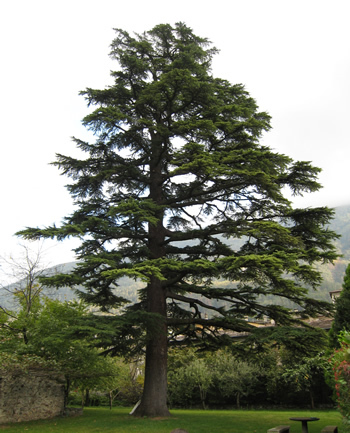 The boast of the garden is a glorious, ancient cedar of Lebanon. I wish I owned a tree like that one. …and we sat in an anteroom full of antique winemaking implements. …and two others that I don’t now remember – I’m a very disorganized wine reporter! “I don’t know anything about art, but I know what I like.” I liked these. And I was very pleased to be given six bottles of the Canua to take home as wages for my translation. There was also bread, cheese, and salame – had we known to expect that, we could have skipped lunch (though that would have been a pity to miss). The Sertoli Salis winery is well worth a visit, both as a historical site and, of course, a place to try and buy some great wine. Tours can be arranged in English. This entry was posted in Lake Como and tagged Italian wine, Italy travel, Lake Como, Valtellina on February 3, 2008 by Deirdre Straughan.